Posted 8/31/13, courtesy of Mountain Views News – Thursday evening, Aug. 22nd, at approximately 9 pm, young Treavor Robinson, 22, was chatting outside with a friend in front of his mother’s house in South Los Angeles. Suddenly, according to eyewitness reports, a car pulled up and an automatic weapon began firing at the two young men. As they tried to run, Treavor was struck in the back and the other young man suffered a non-life threatening head wound. Neither young man had any gang affiliations or associates. In 2003, Treavor moved from Hastings Ranch to Sierra Madre with his adopted parents, Hattie Harris and Susan Henderson. Well known in the community, he was a very polite and pleasant young man. 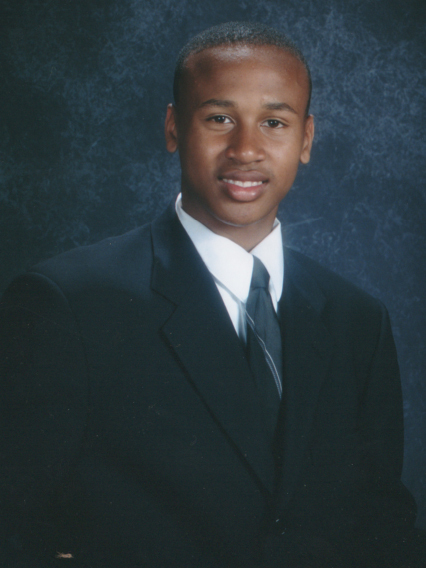 He was active in school activities and in 2005 he was elected Student Body President at Wilson IB Middle School. He played in the Wilson Jazz Band and Orchestra and while at PHS he was a member of the school’s band and the Pasadena All Star Band. He played in Pasadena Rose Parade in 2007. An extremely talented young man, with many gifts, he attended the elite summer band program at St. John’s University in New York in 2006 and world renowned percussionist Terri Lynne Carrington recognized his skills and encouraged him to pursue a career in music. However, Treavor’s zest for life and all it had to offer also drew his attention to the world of acting. He studied under professionals June Chandler and Hal Sweesy in Studio City and also participated in the Improv Classes taught by June in Sierra Madre. He also loved to travel. He hoped to travel across all 50 states before he was 25. He was able to visit Hawaii, New York, Pennsylvania, Ohio, Florida, Colorado, Oregon and Arizona. Wherever he went, he was loved, but New York City was the place that he wanted to call home. Being a good citizen was also important to Treavor. He was very civic minded and willing to help wherever needed. He volunteered at the polls in 2007 and 2008 and was bubbling over with excitement when he cast his first vote for President Obama in 2012. For the last two years he volunteered at Sierra Madre’s Dickens Village and WhoVille Festivals. His passion for helping others also was manifest with his work in a Youth Ministry that went to the juvenile prisons and performed for the children that were there. Treavor leaves behind two very large families and a host of friends to mourn his untimely death. He is survived by his Mother Rosalyn Robinson; brothers Trayvonne and Triston Robinson; Grandmother Marian Robinson and a host of other relatives. Treavor also leaves behind his adopted parents, Hattie Harris and Susan Henderson; adopted brothers Paul Carpenter and Fred (Doreen)Thomas; adopted sister Patricia Carpenter; nieces Maila, Maheilia and Milania Thomas; Uncles Clifford and King Harris; Uncle and Aunt Artie and Grace Sanders and a host of other adopted cousins and family members. Funeral arrangements are currently pending.